Intersections with high forklift traffic and a mix of pedestrians are the highest risk, and shipping docks are among the most dangerous areas of any manufacturing or warehouse operation. This system was implemented for a major manufacturer of paper and pulp products. Here the pedestrians frequently cross a busy forklift aisle. Pedestrians wishing to cross activate the system by push button (located on the pedestrian gates). The system scans for forklift presence in all directions. If the area is clear the system sounds an audible warning and flashes beacons. 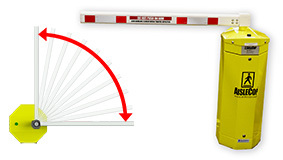 The crossing arm style gates lower to effectively block off the area and once down the pedestrian gates open. At this point the system scans the pedestrian aisle. After the aisle is dormant for a preselected amount of time the system resets. Utilizing timers allows for multiple people to pass through the intersection as long as there are no gaps in the flow of pedestrians longer than timer setting. 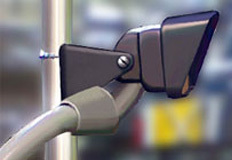 Remotely mounted sensors and warning lights detects and alerts forklifts entering the area through the overhead door shown at the top of the sketch.